Read the book and support OB Rag blog. Use the BUY NOW button at the end of this article to order a copy of BEHIND ENEMY LINES for a $10.00 donation to OB Rag. 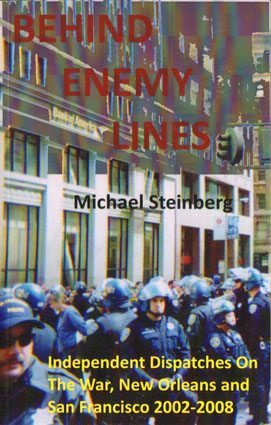 Author/Activist Steinberg has patched together over sixty posts from over the last half dozen years, written mostly for Independent Media Centers (www.indymedia.org) around the country, along with a few published right here at the OB Rag. His narratives, mostly written with a feeling of being in the heat of the moment, are grouped together into five parts: the Anti-Iraq War Movement, Post Katrina New Orleans, the Battle for Public Housing in New Orleans, Entergy Corporation and Their Nuclear Ambitions, and various Bay area protests, including the “No on Prop 98” Campaign waged last year in defense of rent control in California. It takes a while to get accustomed to the breezy and often seemingly disjointed accounts, but, after a while, the bigger picture emerges. This book is a “dispatches from the frontlines” variety of journalism written about a variety of struggles that continue in the United States. In the post-9/11 world, political protests seemingly have all but disappeared from the national consciousness. This author’s work illustrates the point that protests have not stopped. But in an era where the official response to dissent is to lump it in with terrorism, reportage on protests has largely evaporated, partly out of editors fears of being labeled as unpatriotic. It’s also true that the quantity and quality of news reporting in general has declined as a result of economic considerations. But in a world where photographs of the President-Elect sans shirt while on vacation in Hawaii are considered newsworthy, it’s obvious that the contemporary definition what constitutes “news” has devolved in a manner that excludes most mentions of things like protests that are discomforting or challenge the truthiness of the status quo. Steinberg reports on situations that are not easily fitted into thirty second news bites: being booked into jail after being swept up in mass arrests in San Francisco, homeless people in post-Katrina New Orleans being “relocated” by police to keep them out of the public eye, and the ruses used by Chinese government and the City of San Francisco as they sought to obscure the route of the Olympic torch procession as it made its way to the West Coast. Some of the writing is straight-forward enough to pass muster by an AP-Stylebook wielding editor: sources are quoted, names are named, and documents are referenced. It’s journalism in the style of I.F. Stone. The shortness of many of the articles, i.e., the “dispatch nature” of the journalism, left me wanting much more in the way of context and analysis. Eventually, over the course of the book, much of the context reveals itself. But it makes for slow and disjointed reading. As the march moved along at an increasing pace, neighborhood people came out and joined in. The signs of poverty were everywhere, blighted houses, hard cynical faces, check cashing and discount liquor stores, piles of debris the floods had left behind. But so too was the exuberance of the residents, those who had survived, who had the will and wherewithal to come back…During slavery this was the only part of the city where African Americans could freely express themselves. People were still carrying on, honoring the dead and inspiring the living to go on, just like a good jazz funeral should. The party might be over tomorrow, and the grim racist realities the professors so eruditely, and likewise passionately, elucidated the night before will still be looming. But for today, the Other New Orleans was back on the streets, and the streets were theirs again. 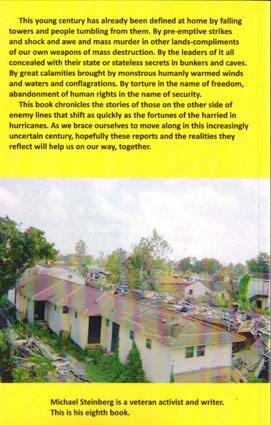 The author’s New Orleans dispatches effectively drive home the point about just how convoluted reality has become in this post 9/11 era, when he reports that looters arrested at the Burlington Coat Factory in the wake of hurricane Katrina were sentenced to more time in prison then Enron’s corporate looter Andrew Fastow. Or when a protestor is charged with felony “terror” charges for using a pipe and chain to fasten herself to a chain link fence. Or when he reports about the killings by vigilantes (which has recently become big news) of residents in the Algiers neighborhood. This is history that should not be allowed to be buried by the mountains of misrepresentations promulgated by the apologists for that period. People around the country have continued to stand up for their rights and the rights of others, even when those acts were “invisible” to the mainstream media. Michael Steinberg’s book documents those protests from the point of view of those who had the backbone and the foresight to stand up and be counted. Read Michael Steinberg’s book and support the OB Rag blog. Use the PayPal “BUY NOW” below and order a copy through us for a donation of $10.00, plus $3.00 for shipping. i’ve also posted this review in my dairy at daily kos…..